Aims: The present study is to determine the expression of aldehyde dehydrogenase 1 (ALDH1) and ATPbinding cassette superfamily G member 2 (ABCG2) in patients with triple-negative breast cancer, and to understand the relationship of ALDH1 and ABCG2 with triple-negative breast cancer. Methods: A total of 56 patients who received triple-negative breast cancer resection and axillary lymph node dissection at our hospital between August 2013 and June 2016 were included in the present study. Primary focus tissues, tumor-adjacent tissues and lymph node tissues of the patients were collected. According to pathological examinations, 21 patients had lymph node metastasis (metastasis group), and 35 had no lymph node metastasis (non-metastasis group). Tumor-adjacent tissues were used as control group. MDA-MB-231 cells were transfected with small-interfering RNA to inhibit the expression of ALDH1 and ABCG2. Quantitative real-time polymerase chain reaction was used to determine the expression of mRNA, while Western blotting was carried out to measure protein expression. MTT assay was employed to determine the proliferation of MDA-MB-231 cells. Results: Expression of ALDH1 and ABCG2 mRNA and protein was elevated in breast cancer tissues and metastatic lymph node. Transfection with the siRNA of ALDH1 and ABCG2 reduced the expression of ALDH1 and ABCG2, respectively. Down-regulation of ALDH1 and ABCG2 expression decreased the proliferation of MDA-MB-231 cells. Conclusion: The present study demonstrates that the expression of ALDH1 and ABCG2 in primary tumor tissues from patients with triple-negative breast cancer is increased than that in tumor-adjacent tissues, and the expression of ALDH1 and ABCG2 in lymph node in patients with lymph node metastasis is higher than that in patients without lymph node metastasis. ALDH1 and ABCG2 may regulate the invasion and lymph node metastasis, or affect the drug resistance of triple-negative breast cancer. Breast cancer is one of the most common malignant tumors in adult women that threatens the life and health of women all over the world . Triple-negative breast cancer accounts for 12-17% of breast cancer cases, with an immunohistochemical manifestation of decreased expression of estrogen receptor (ER), progesterone receptor (PR) and human epidermal growth factor receptor 2 (HER-2). Triple-negative breast cancer has poor prognosis, and cannot be treated by endocrine therapy. It is reported that triple-negative breast cancer and breast cancer with overexpression of HER-2 have higher local recurrence rates than other types of breast cancer [2-5]. Patients with distal metastasis and local recurrence of triplenegative breast cancer usually have higher mortality rate than patients with other types of breast cancer. In addition, the survival time of patients with distal metastasis and local recurrence of triple-negative breast cancer is shorter than that of patients with other types of breast cancer . Axillary lymph node (ALN) and internal mammary lymph node (IMLN) are important metastatic sites of breast cancer, and the metastatic status at these lymph nodes are key basis for the determination of clinical or pathological staging, judgement of prognosis and definition of supplementary treatment plan [7,8]. A study shows that about 90% chemotherapy failures in patients with metastatic breast cancer are due to multidrug resistance (MDR), which has become one of the difficulties in the treatment of breast cancer . Aldehyde dehydrogenase 1 (ALDH1) is related to the occurrence and development of many kinds of human tumors, and increased expression of ALDH1 suggests bad sensitivity to chemotherapy drugs and poor prognosis [9-12]. ALDH1 plays a role in regulating apoptosis, but its mechanism of action is not clear yet . ATP-binding cassette superfamily G member 2 (ABCG2) is a member of ATP-binding cassette transporter superfamily and its effect in MDR is not negligible [14,15]. By now, there are few studies on the effect of ALDH1 or ABCG2 on the occurrence and lymph node metastasis of triple-negative breast cancer. In the present study, we determine the expression of ALDH1 and ABCG2 in patients with triple-negative breast cancer, and try to understand the relationship of ALDH1 and ABCG2 with triple-negative breast cancer. A total of 56 patients who received triple-negative breast cancer resection and axillary lymph node dissection at our hospital between August 2013 and June 2016 were included in the present study. Primary focus tissues, tumor-adjacent tissues and lymph node tissues of all patients were collected and stored in liquid nitrogen. According to pathological examinations, 21 patients had lymph node metastasis (metastasis group), and 35 had no lymph node metastasis (nonmetastasis group). Tumor-adjacent tissues from all 56 patients were used as control group. Non-metastasis group had an age range of 25-60 years, and a median age of 40 years; metastasis group had an age range of 26-62 years, and a median age of 41 years. All patients were having the first onset of triple-negative breast cancer. None of the patients had taken hormones, traditional Chinese medicine or chemotherapy before surgery. All procedures were approved by the Ethics Committee of Soochow University. Written informed consents were obtained from all patients or their families. One day before transfection, MDA-MB-231 cells in log-phase growth (3 × 105) were seeded onto 24-well plates containing antibiotics-free F12/DMEM medium supplemented with 10% fetal bovine serum. When reaching 70% confluency, 1 μl small-interfering RNA (siRNA; Sangon Biotech Co., Ltd., Shanghai, China) and 1 μl liposome (Lipofectamine 2000; Thermo Fisher Scientific, Waltham, MA, USA) were mixed with 50 μl Opti Memi medium, respectively, in individual Eppendorf tubes. After standing still for 5 min, the mixtures in the two Eppendorf tubes were mixed and kept under room temperature for 20 min, followed by addition into each culture well. Six hours later, the medium was replaced by fresh F12/ DMEM medium supplemented with 10% fetal bovine serum, and the cells were cultured under normal condition for 48 h before harvest for further use. Tissues (100 mg) were ground into powder in liquid nitrogen and mixed with 1 ml Trizol (10606ES60; Yeasen, Shanghai, China) for lysis. Liquid samples (100 μl) were directly mixed with 1 ml Trizol (10606ES60; Yeasen, Shanghai, China) for lysis. Then, total RNA was extracted using phenol chloroform method. The purity of RNA was determined by A260/A280 using ultraviolet spectrophotometry (Nanodrop ND2000, Thermo Scientific, Waltham, MA, USA). Then, cDNA was obtained by reverse transcription from 1 μg RNA and stored at -20°C. Reverse transcription of mRNA was performed using TIANScript II cDNA First Strand Synthesis Kit (KR107; TIANGEN, Beijing, China). SuperReal PreMix (SYBR Green) (FP204; TIANGEN, Beijing, China) was used to detect mRNA expression, using GAPDH as internal reference. The reaction system (20 μl) was composed of 10 μl qRT-PCR-Mix, 0.5 μl upstream primer (ALDH1, 5’- CCGTGGCGTACTATGGATGC-3’; ABCG2, 5’- ATTGAAGGCAAAGGCAGATG-3’; GAPDH, 5’- TGTTCGTCATGGGTGTGAACC-3’), 0.5 μl downstream primer (ALDH1, 5’-CGCAATGTTTTGATGCAGCCT-3’; ABCG2, 5’-TGAGTCCTGGGCAGAAGTTT-3’; GAPDH, 5’- ATGGACTGTGGTCATGAGTCC-3’), 2 μl cDNA and 7 μl ddH2O. PCR condition was: initial denaturation at 95°C for 30 s; 39 cycles of denaturation at 95°C for 5 s, annealing at 60°C for 20 s (iQ5; Bio-Rad, Hercules, CA, USA). The 2-ΔΔCt method was used to calculate the relative expression of ALDH1 or ABCG2 mRNA against GAPDH. Each sample was tested in triplicate. Samples were mixed with precooled Radio- Immunoprecipitation Assay (RIPA) lysis buffer (600 μl; 50 mM Tris-base, 1 mM EDTA, 150 mM NaCl, 0.1% sodium dodecyl sulfate, 1% TritonX-100, 1% sodium deoxycholate; Beyotime Institute of Biotechnology, Shanghai, China). After lysis for 50 min on ice, the mixture was centrifuged at 12,000 g/min and 4°C for 5 min. The supernatant was used to determine protein concentration by bicinchoninic acid (BCA) protein concentration determination kit (RTP7102, Real-Times Biotechnology Co., Ltd., Beijing, China). Protein samples (20 μg) were then mixed with sodium dodecyl sulfate loading buffer before denaturation in boiling water bath for 5 min. Afterwards, the samples were subjected to 10% sodium dodecyl sulfate-polyacrylamide gel electrophoresis. The resolved proteins were transferred to polyvinylidene difluoride membranes on ice (100 V, 2 h) and blocked with 5% skimmed milk at room temperature for 1 h. Then, the membranes were incubated with rabbit anti-human ALDH1 polyclonal primary antibody (1:1,000; ab52492; Abcam, Cambridge, UK), rabbit anti-human ABCG2 polyclonal primary antibody (1:1,500; ab24115; Abcam, Cambridge, UK) and rabbit anti-human β- actin monoclonal primary antibody (1:5,000; ab8227; Abcam, Cambridge, UK) at 4°C overnight. After extensive washing with phosphate-buffered saline with Tween 20 for 3 times of 15 min, the membranes were incubated with goat anti-rabbit horseradish peroxidase-conjugated secondary antibody (1:3,000; ab6721; Abcam, Cambridge, UK) for 1 h at room temperature before washing with phosphate-buffered saline with Tween 20 for 3 times of 15 min. Then, the membrane was developed with enhanced chemiluminescence detection kit (ab65623; Abcam, Cambridge, UK) for imaging. Image lab v3.0 software (Bio-Rad, Hercules, CA, USA) was used to acquire and analyze imaging signals. The relative expression of target proteins was calculated against β-actin. Cells were added into 96-well plate at a density of 2 × 103 cells per well in triplicate. At 24, 48 and 72 h, 5 g/L MTT (20 μl per well) was added. On the last day of culture, DMSO (150 μl per well) was added to dissolve purple crystal. After incubation at 37°C for 4 h, absorbance of each well was measured at 490 nm with a microplate reader (Bio-Rad, Hercules, CA, USA) for plotting cell growth curves. The results were analyzed using SPSS 18.0 statistical software (IBM, Armonk, NY, USA). The data were expressed as means ± standard deviations. Data were tested for normality. Multigroup measurement data were analyzed using one-way ANOVA. In case of homogeneity of variance, Least Significant Difference and Student-Newman-Keuls methods were used; in case of heterogeneity of variance, Tamhane’s T2 or Dunnett’s T3 method was used. P<0.05 indicated statistically significant differences. To measure the expression of mRNA, qRT-PCR was performed. 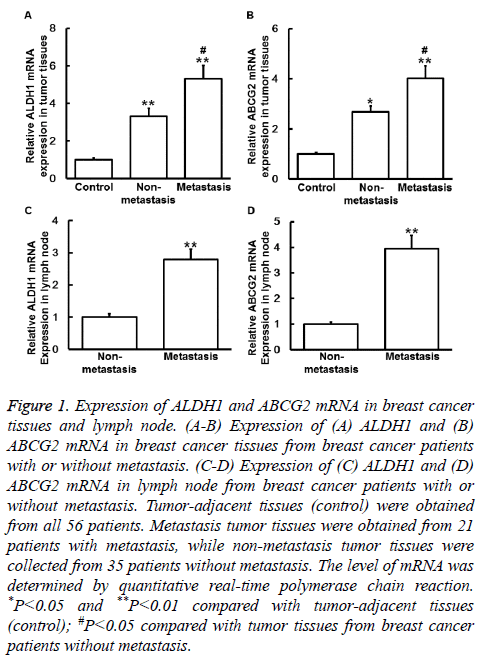 The data showed that the levels of ALDH1 mRNA in primary tumor tissues from non-metastasis group and metastasis group were both significantly higher than that in control (P<0.05), and the value of metastasis group was significantly higher than that of non-metastasis group (P<0.05) (Figure 1A). Similarly, the levels of ABCG2 mRNA in tumor tissues from non-metastasis group and metastasis group were also significantly higher than that in control (P<0.05), and the value of metastasis group was significantly higher than that of non-metastasis group (P<0.05) (Figure 1B). In addition, the levels of ALDH1 and ABCG2 mRNA in lymph node from metastasis group were significantly higher than those from non-metastasis group, respectively (P<0.05) (Figures 1C and 1D). The results suggest that expression of ALDH1 and ABCG2 mRNA is elevated in breast cancer tissues and metastatic lymph node. Figure 1: Expression of ALDH1 and ABCG2 mRNA in breast cancer tissues and lymph node. (A-B) Expression of (A) ALDH1 and (B) ABCG2 mRNA in breast cancer tissues from breast cancer patients with or without metastasis. (C-D) Expression of (C) ALDH1 and (D) ABCG2 mRNA in lymph node from breast cancer patients with or without metastasis. Tumor-adjacent tissues (control) were obtained from all 56 patients. Metastasis tumor tissues were obtained from 21 patients with metastasis, while non-metastasis tumor tissues were collected from 35 patients without metastasis. The level of mRNA was determined by quantitative real-time polymerase chain reaction. *P<0.05 and **P<0.01 compared with tumor-adjacent tissues (control); #P<0.05 compared with tumor tissues from breast cancer patients without metastasis. 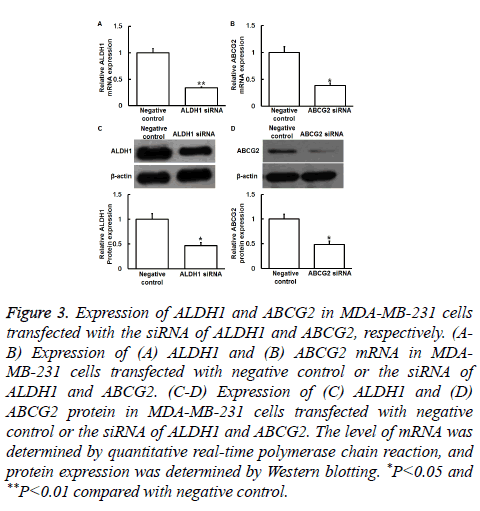 To determine ALDH1 and ABCG2 protein expression, Western blotting was carried out. The data showed that ALDH1 and ABCG2 protein levels in primary tumor tissues from nonmetastasis group and metastasis group were significantly higher than those in control (P<0.05), and the values of metastasis group were significantly higher than those of nonmetastasis group (P<0.05) (Figures 2A and 2B). Moreover, protein levels of ALDH1 and ABCG2 in lymph node from metastasis group were significantly higher than those from non-metastasis group (P<0.05) (Figures 2C and 2D). The results indicate that ALDH1 and ABCG2 protein expression is increased in breast cancer tissues and metastatic lymph node. Figure 2: Expression of ALDH1 and ABCG2 protein in breast cancer tissues and lymph node. 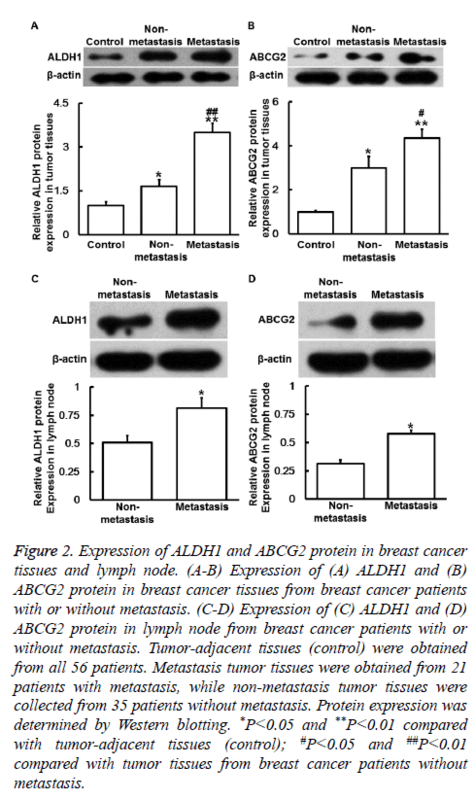 (A-B) Expression of (A) ALDH1 and (B) ABCG2 protein in breast cancer tissues from breast cancer patients with or without metastasis. (C-D) Expression of (C) ALDH1 and (D) ABCG2 protein in lymph node from breast cancer patients with or without metastasis. Tumor-adjacent tissues (control) were obtained from all 56 patients. Metastasis tumor tissues were obtained from 21 patients with metastasis, while non-metastasis tumor tissues were collected from 35 patients without metastasis. Protein expression was determined by Western blotting. *P<0.05 and **P<0.01 compared with tumor-adjacent tissues (control); #P<0.05 and ##P<0.01 compared with tumor tissues from breast cancer patients without metastasis. To understand the mechanisms of action of ALDH1 and ABCG2, the expression of ALDH1 and ABCG2 was silenced by transfection of MDA-MB-231 cells with their siRNA. 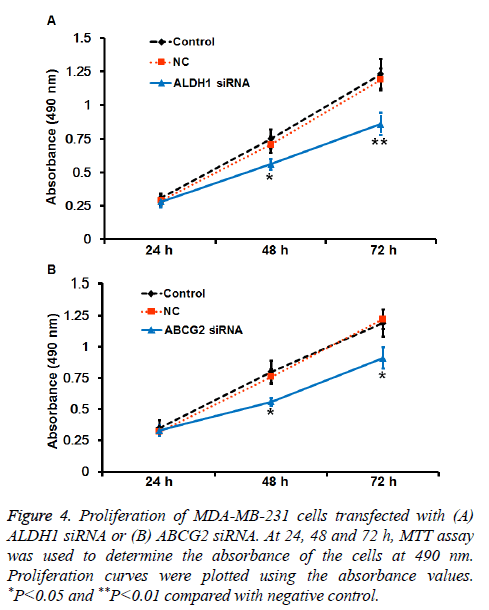 qRTPCR and Western blotting showed that the levels of ALDH1 and ABCG2 mRNA and protein in MDA-MB-231 cells transfected with siRNA of ALDH1 and ABCG2, respectively, were significantly reduced compared with negative control (P<0.05) (Figures 3A-3D). In addition, MTT assay showed that the absorbance of cells transfected with ALDH1 and ABCG2 siRNA was significantly lower than that of cells in control and negative control groups at 48 or 72 h (P<0.05) (Figures 4A and 4B). The results suggest that reduced expression of ALDH1 or ABCG2 inhibits the proliferation of MDA-MB-231 cells. Figure 3: Expression of ALDH1 and ABCG2 in MDA-MB-231 cells transfected with the siRNA of ALDH1 and ABCG2, respectively. (AB) Expression of (A) ALDH1 and (B) ABCG2 mRNA in MDAMB- 231 cells transfected with negative control or the siRNA of ALDH1 and ABCG2. (C-D) Expression of (C) ALDH1 and (D) ABCG2 protein in MDA-MB-231 cells transfected with negative control or the siRNA of ALDH1 and ABCG2. The level of mRNA was determined by quantitative real-time polymerase chain reaction, and protein expression was determined by Western blotting. *P<0.05 and **P<0.01 compared with negative control. Figure 4: Proliferation of MDA-MB-231 cells transfected with (A) ALDH1 siRNA or (B) ABCG2 siRNA. At 24, 48 and 72 h, MTT assay was used to determine the absorbance of the cells at 490 nm. Proliferation curves were plotted using the absorbance values. *P<0.05 and **P<0.01 compared with negative control. The concept of triple-negative breast cancer is put forward in 2005, and it is closely related with basal-like breast cancer that has poor prognosis . The resistance of breast cancer cells to chemotherapy drugs limits the efficacy of these drugs. The resistance of cancer cells to chemotherapy includes natural resistance (or primary resistance), acquired resistance (or secondary resistance), and multidrug resistance (or cross resistance) . ALDH1 is a protein related with drug resistance and cell apoptosis. The proliferation, colony formation, adhesion, migration and invasion of cells with increased ALDH1 expression are all elevated. It is reported that up-regulated expression of ALDH1 is related with poor prognosis . In addition, the positive rate of ALDH1 in African breast cancer patients is about 48% . The positive rate of ALDH1 in patients treated with cyclophosphamide-based chemotherapy is 61%, suggesting that ALDH1 may reflect the biological behavior of breast cancer . Moreover, reduced ALDH1 expression can induce cell apoptosis, but its mechanism of action is not clear yet [18,19]. In the present study, we discover that the expression of ALDH1 mRNA and protein is upregulated in breast cancer tissues, and the values in patients with metastasis are significantly higher than those in patients without metastasis. In addition, the expression of ALDH1 in lymph node from patients with metastasis is significantly higher than that from patients without metastasis. Our data suggest that specifically elevated ALDH1 expression in triple-negative breast cancer plays important roles in drug resistance and metastasis of the disease. ABCG2 mediates unidirectional efflux function, and pumps substrates in the cytoplasm out of the cells [20,21], reducing the accumulation and absorption of toxic substances by the cells. We hypothesize that high expression of ABCG2 results in the drug resistance of triplenegative breast cancer. Our results demonstrate that the expression of ABCG2 mRNA and protein are elevated in breast cancer tissues and metastatic lymph node, suggesting that specifically elevated expression of ABCG2 in triplenegative breast cancer results in the drug resistance of the disease. Studies on ABCG2 are mainly focused on the drug resistance of tumors, while studies on ALDH1 are mostly concentrated on the apoptosis, invasion and metastasis of tumors. In the present study, we have also investigated the effect of ALDH1 and ABCG2 on the proliferation of triple-negative breast cancer MDA-MB-231 cells. After interference of ALDH1 and ABCG2 expression by transfection with their siRNA, MTT assay has shown that reduced expression of ALDH1 or ABCG2 inhibits the proliferation of MDA-MB-231 cells, suggesting that high expression of ALDH1 or ABCG2 is closely related with the proliferation of triple-negative breast cancer cells. In conclusion, the present study demonstrates that elevated expression of ALDH1 or ABCG2 affects the apoptosis, metastasis and drug resistance of triple-negative breast cancer, and can be a potential biomarker and therapeutic target for the disease. This work was supported by Soochow University. We would also like to thank Drs. Jienong Wu and Yajun Sun from The Affiliated Hospital of Jiangsu University for their great help. Harris LN, Broadwater G, Lin NU, Miron A, Schnitt SJ, Cowan D, Lara J, Bleiweiss I, Berry D, Ellis M, Hayes DF, Winer EP, Dressler L. Molecular subtypes of breast cancer in relation to paclitaxel response and outcomes in women with metastatic disease: results from CALGB 9342. Breast Cancer Res 2006; 8: R66. Nguyen PL, Taghian AG, Katz MS. Breast cancer subtype approximated by estrogen receptor, progesterone receptor, and HER-2 is associated with local and distant recurrence after breast-conserving therapy. J Clin Oncol 2008; 26: 2373-2378. Millar EK, Graham PH, O'Toole SA. Prediction of local recurrence, distant metastases, and death after breast-conserving therapy in early-stage invasive breast cancer using a five-biomarker panel. J Clin Oncol 2009; 27: 4701-4708. Metzger-Filho O, Sun Z, Viale G. Patterns of Recurrence and outcome according to breast cancer subtypes in lymph node-negative disease: results from international breast cancer study group trials VIII and IX. J Clin Oncol 2013; 31: 3083-3090. Montagna E, Bagnardi V, Rotmensz N, Viale G, Renne G, Cancello G, Balduzzi A, Scarano E, Veronesi P, Luini A, Zurrida S, Monti S, Mastropasqua MG, Bottiglieri L, Goldhirsch A, Colleoni M. Breast cancer subtypes and outcome after local and regional relapse. Ann Oncol 2012; 23: 324-331. Bucalossi P, Veronesi U. Long-term results of radical mastectomy with removal of internal mammary chain. Acta Unio Int Contra Cancrum 1959; 15: 1052-1055. Lacour J, Bucalossi P, Cacers E. Radical mastectomy versus radical mastectomy plus internal mammary dissection. Five-year results of an international cooperative study. Cancer 1976; 37: 206-214. Mette MF, Matzke AJ, Matzke MA. Resistance of RNA-mediated TGS to HC-Pro, a viral suppressor of PTGS, suggests alternative pathways for dsRNA processing. Curr Biol 2001; 11: 1119-1123. Sladek NE, Kollander R, Sreerama L. Cellular levels of aldehyde dehydrogenases (ALDH1A1 and ALDH3A1) as predictors of therapeutic responses to cyclophosphamide-based chemotherapy of breast cancer: a retrospective study. Rational individualization of oxazaphosphorine-based cancer chemotherapeutic regimens. Cancer Chemother Pharmacol 202; 49: 309-321. Ginestier C, Hur MH, Charafe-Jauffret E, Monville F, Dutcher J, Brown M, Jacquemier J, Viens P, Kleer CG, Liu S, Schott A, Hayes D, Birnbaum D, Wicha MS, Dontu G. ALDH1 is a marker of normal and malignant human mammary stem cells and a predictor of poor clinical outcome. Cell Stem Cell 2007; 1: 555-567. Canuto RA, Muzio G, Salvo RA, Maggiora M, Trombetta A, Chantepie J, Fournet G, Reichert U, Quash G. The effect of a novel irreversible inhibitor of aldehyde dehydrogenases 1 and 3 on tumour cell growth and death. Chem Biol Interact 2001; 130-132: 209-18. Nalwoga H, Arnes JB, Wabinga H, Akslen LA. Expression of aldehyde dehydrogenase 1 (ALDH1) is associated with basal-like markers and features of aggressive tumours in African breast cancer. Br J Cancer 2010; 102: 369-375. Fire A, Xu S, Montgomery MK, Kostas SA, Driver SE, Mello CC. Potent and specific genetic interference by double-stranded RNA in Caenorhabditis elegans. Nature 1998; 391: 806-811. Paddison PJ, Caudy AA, Bernstein E. Short hairpin RNAs (shRNAs) induce sequence-specific silencing in mammalian cells. Genes Dev 2002; 16: 948-958. Brenton JD, Carey LA, Ahmed AA, Caldas C. Molecular classification and molecular forecasting of breast cancer: ready for clinical application? J Clin Oncol 2005; 23: 7350-7360. Perou CM, Sørlie T, Eisen MB, van de Rijn M, Jeffrey SS, Rees CA, Pollack JR, Ross DT, Johnsen H, Akslen LA, Fluge O, Pergamenschikov A, Williams C, Zhu SX, Lønning PE, Børresen-Dale AL, Brown PO, Botstein D. Molecular portraits of human breast tumours. Nature 2000; 406: 747-752. Quash G, Fournet G, Chantepie J, Gore J, Ardiet C, Ardail D, Michal Y, Reichert U. Novel competitive irreversible inhibitors of aldehyde dehydrogenase (ALDH1): restoration of chemosensitivity of L1210 cells overexpressing ALDH1 and induction of apoptosis in BAF(3) cells overexpressing bcl(2). Biochem Pharmacol 2002; 64: 1279-1292. Choudhary S, Xiao T, Vergara LA. Role of aldehyde dehydrogenase isozymes in the defense of rat lens and human lens epithelial cells against oxidative stress. Invest Ophthalmol Vis Sci 2005; 46: 259-267. Pires Ado R, Lecerf-Schmidt F, Guragossian N. New, highly potent and non-toxic, chromone inhibitors of the human breast cancer resistance protein ABCG2. Eur J Med Chem 2016; 122: 291-301. Ricci JW, Lovato DM, Severns V, Sklar LA, Larson RS. Novel ABCG2 Antagonists Reverse Topotecan-Mediated Chemotherapeutic Resistance in Ovarian Carcinoma Xenografts. Mol Cancer Ther 2016; 15: 2853-2862.